CaviWipes1 from Metrex is a 1 step low alcohol surface disinfectant disposable wipe. 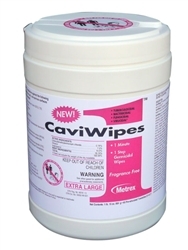 The all new, exceptionally fast and effective CaviWipes 1 is Metrex’s next generation surface disinfection. It is a multi-purpose disinfectant/ decontaminate wipe that can be used on hard, nonporous surfaces. CaviWipes1 is the only low-alcohol surface disinfectant wipe that kills TB in 1 minute. The improvements in the latest formulation are effective in killing 99.9 of bacteria, viruses and fungi in 1-minute including TB, MDR A baumannii, HIV-1, HBV, HCV and many more. When used as directed the fragrance-free CaviWipes1 will effectively clean and disinfect surfaces and can help reduce the risk of cross contamination. For hard non-porous surfaces only. Not for use directly on patients skin. Please see Skin Cleanser or Skin Care Products for products to use to keep skin healthy and clean.